The Kettler Side-Stepper offers a high training comfort thanks to the hydraulic absorbers. The parallel movement of the treads ensures a high effectivity of the training. Due to this parallel movement, your hips are activated - it's a great tightening effect combined with unique movement to burn several calories. The integrated training computer displays number of steps, time, cadence, and energy consumption. Fantastic! The quality of Kettler never disappoints. Very well made and sturdy. 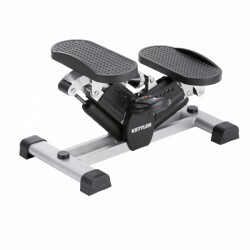 This is my second Kettler side stepper. I love the new model! Highly recommended. My previous stepper "died" after 3 months use. This one is clearly stronger/more sturdily made. It also provides a noticeably more strenuous workout which is appreciated.Can not give 5 stars until it proves it's longevity but indications are positive.